The Indian River Lakes have been a very special place as far back as Jim Ninos can remember. When he was a kid, his mom and dad would bring the family up to one of three lakes: Muskellunge Lake, Grass Lake or Black Lake. Every once in a while they would come up for short trips with his dad and uncle, but around the middle of August they would spend a whole week fishing, swimming, and jumping off the cliffs. In 1993, Jim and his wife, Karrie, bought the Grass Lake cottage where he spent his summers as a kid. That’s where his family, sons Kolby and Trevor and granddaughter Illiana, have spent the summers since. The lake has been a passion of Jim’s and he has spent a great deal of time working to preserve its beauty and environmental quality. In 2012, he was introduced to the Indian River Lakes Conservancy when it helped Grass Lake with a management plan. Jim was elected to the board of directors in 2014. This has provided him with a wider perspective of the area and the environmental impacts on each of the 18 lakes. Each has its own unique character and challenges. From 2006 to 2010, Jim was the president of Grass Lake Association and still serves on several committees. He is also a member of the New York State Federation of Lakes Association. At his home in Alfred, New York, he was elected to two different School Boards, Andover Central School and Alfred Almond Central School. Jim is a long-time member of the Allegany County Planning Board where he currently chairs the staff development committee. In 2014, he retired from teaching after 32 years. Jim’s education background is in fine arts with a BFA from the University of Colorado and an MFA in photography from the Rochester Institute of Technology. In the late 1990s, he received a CAS Degree from SUNY Cortland in School Administration. As an educator, Jim taught at the public school level at Jasper-Troupsburg and Andover Central Schools; and at the college level at Alfred State College and Alfred University as an assistant professor. One of his greatest passions today is water quality. Jim spent years learning about the lake environmental issues. From invasive species, blue green algae, phosphorous and nitrogen over loads in lakes, and the effects they have on the dissolved oxygen in the lake. He is part of the Grass Lake Citizens Statewide Lake Assessment Program(CSLAP) team. Every two weeks, from June to October, Jim takes water samples from the lake and sends them to the DEC for analysis. Each year he receives a report on the state of the lake. On Grass Lake, Jim is the website creator, keeper, and communicator. 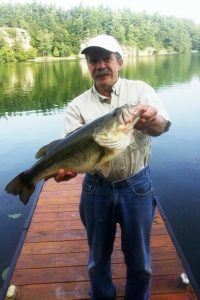 Jim also loves to fish, a passion that is so well known that he has become the person to watch on Grass Lake to see where to go fishing. This, of course, is not a blessing.